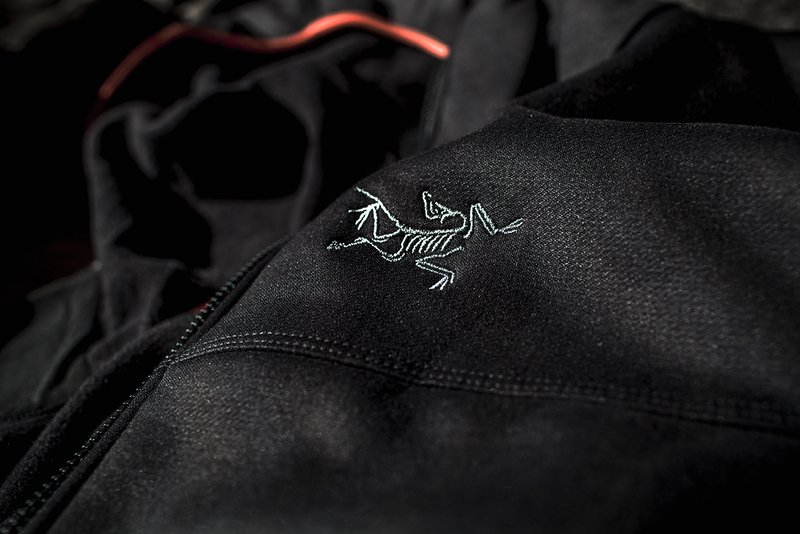 Warm and wind resistant, the Arenite Hoody mixed between soft-shell and fleece comforts for high-output activities in the cold. Fleece is an interesting thing for the outdoors. It’s light, warm, and breathes extremely well; perfectly suited for high output pursuits. But, it breaths so well that a chilly wind can sap all the warm you’ve been holding in seconds. Since wanting something more flexible, I decided to try the Arc’teryx Arenite Hoody, made with “cobblecomb” fleece to see if it could suit my needs. I put it through some paces in 40F temperatures at Desolation Wilderness and so far it’s lived up to how I thought it would. I really liked the hard-wearing Cobblecomb fleece for it’s ability to slow wind, stay tough when rubbing against rocks and still keep me warm. With nothing but a light t-shirt on underneath, this fleece kept me nice and toasty and without worry that I was going to snag on anything scratch. A close fitting, helmet style hood made sure my ears were warm, though I wish it fit a bit differently. I sort of look like I’m ready to go scuba diving anytime I put it on. Quick zippers stay where they are but with an easy pull they slide away with little friction, great for if you only have one hand free. I liked the side pockets, which were large enough to put gloves, a beanie, maps or anything of similar size. The only thing I hated about the Arenite is the rather slim fit under the arm pits. * Everything else fits me perfectly, but for some reason the pits feel a bit constructive, something that hopefully stretches out over time. If you have a big chest and dislike that sort of thing, you might want to look for another option. Great for playing dual roles, I have a feeling this hoody will be my go-to for fast hikes in the cold. It fits well underneath an Alpha hardshell, so I know it will be versatile enough for a huge range of fun. At $180, the Arc’teryx Arenite Hoody is pricey, but I think the durability and warmth will end up making it a good investment. *UPDATE, Dec. 15 – The pits area has loosened up a bit over time, but the the hoody is still pretty snug.